LIVINGSTON, Edward, (brother of Robert R. Livingston and cousin of Philip Livingston and William Livingston), a Representative from New York and a Representative and a Senator from Louisiana; born in Clermont, Livingston Manor, N.Y., May 28, 1764; attended private schools; graduated from the College of New Jersey (now Princeton University) in 1781; studied law in Albany, N.Y.; admitted to the bar in 1785 and commenced practice in New York City; elected from New York to the Fourth, Fifth, and Sixth Congresses (March 4, 1795-March 3, 1801); chairman, Committee on Commerce and Manufactures (Fifth Congress); United States district attorney 1801-1803; mayor of New York City 1801-1803; moved to New Orleans, La., in 1804; engaged in the practice of law and in the real estate business; author of a legal code for Louisiana; served at the Battle of New Orleans; member, State house of representatives 1820; elected from Louisiana to the Eighteenth, Nineteenth, and Twentieth Congresses (March 4, 1823-March 3, 1829); elected to the United States Senate and served from March 4, 1829, until May 24, 1831, when he resigned, having been appointed to the Cabinet; Secretary of State in the Cabinet of President Andrew Jackson 1831-1833; Minister Plenipotentiary to France 1833-1835; inherited from his sister "Montgomery Place," on the Hudson River, Barrytown, Dutchess County, N.Y., and died there May 23, 1836; interment in the family vault at "Clermont," Columbia County, N.Y.; remains later removed to Rhinebeck, N.Y.
Papers: Correspondence concerning land claims in Charles I. du Pont papers, 1807-1892; Eleuthere Irenee du Pont papers, 1771-1922 and 1782-1838; Victor Marie du Pont papers, 1753-1847; Benjamin Henry Latrobe papers, 1788-1820, on 315 microfiche; and Pierre S. du Pont collection, 1438-1954. Papers: May 15, 1821. 1 letter. To Governor Samuel Bell of New Hampshire. Papers: Correspondence in Maria and Elizabeth Gilpin collection, 1739-1878; Gilpin family papers, 1727-1872; correspondence (1831-1833) in Charles Jared Ingersoll papers, 1803-1862; and Peter S. DuPonceau correspondence, 1777-1844. Papers: In Edward M. Greenway collection, 1737-1876. Papers: Correspondence in Livingston family papers, 1732-1833; Thomas Jefferson papers; James Madison papers; James Monroe papers; John Nicholson family papers, 1786-1868; Henry Bartholomew Cox autograph collection, 1502-1965; and in Nicholas Philip Trist papers, 1795-1873. Papers: 1809-1832. 3 letters. Also portraits. Papers: In Livingston family papers, 1719-1889. Chiefly concerning family and political matters. Papers: 12 letters (1796-1833) to Henry D. Gilpin and others in Elizabeth M. Smith collection, supplement 2; and 1 letter (May 19, 1830) concerning legal matters. Papers: 1 letter (October 22, 1802) in the Caesar Rodney papers. Papers: 1801-1835. 8 items. Also in John Williams papers, 1767-1841; and Aaron Vail papers, 1812-1888. Papers: 1683-1877 (bulk 1764-1836). 75.5 cubic feet. Includes family and official correspondence; papers related to public offices/public life; papers related to the Penal Code, criminal jurisprudence, and related topics; writings; legal records; financial records; wills, inventories, and estate papers; certificates, awards, degrees, honors, and official documents; and published material. Papers: Correspondence in Aldrich family papers, 1770-1895, primarily concerning the career of John Armstrong, on 1 microfilm reel. Permission required for access. Papers: July 24, 1828; [ca. 1831]. 2 items. Also in Jesse D. Elliott papers, 1824-1839. Papers: In DeWitt family papers, 1705-1952 (bulk 1750-1839). Papers: Correspondence in George Bryan Porter papers, 1765-1837 and 1842-1882. Papers: Miscellaneous items. Finding aid. Papers: In Samuel Blachley Webb papers, 1756-1819. Carosso, Vincent P., and Lawrence H. Leder. "Edward Livingston and Jacksonian Diplomacy." Louisiana History 7 (Summer 1966): 241-48. Flory, Ira, Jr. "Edward Livingston's Place in Louisiana Law. "Louisiana Historical Quarterly 19 (April 1936): 328-89. 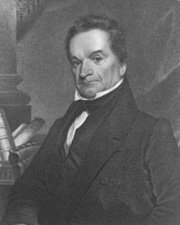 Hatcher, William B. Edward Livingston: Jeffersonian Republican and Jacksonian Democrat. 1940. Reprint. Gloucester, MA: P. Smith, 1970. ___. "Edward Livingston's View of the Nature of the Union. "Louisiana Historical Quarterly 24 (July 1941): 698-728. Hunt, Charles Havens. Life of Edward Livingston. New York: D. Appleton & Co., 1864. Livingston, Edward. Address to the People of the United States, on the Measures Pursued by the Executive with Respect to the Batture at New Orleans. 2 vols. New Orleans: Bradford & Anderson, 1808. ___. The Complete Works of Edward Livingston on Criminal Jurisprudence. 2 vols. 1873. Reprint. Montclair, NJ: Patterson Smith, 1968. Lyons, Grant. "Louisiana and the Livingston Criminal Codes." Louisiana History 15 (Summer 1974): 243-72. Mackey, Philip English. "Edward Livingston and the Origins of the Movement to Abolish Capital Punishment in America." Louisiana History 16 (Spring 1975): 145-66. Padgett, James A. "The Ancestry of Edward Livingston of Louisiana: The Livingston Family." Louisiana Historical Quarterly 19 (October 1936): 900-937. ___, ed. "Letters of Edward Livingston to Presidents of the United States." Louisiana Historical Quarterly 19 (October 1936): 938-63.